“Paul Bear”, sponsored by Ott Funeral Home and fashioned by artist Joe Hoover, waits longingly to comfort others in times of need; the pink carnation which decorates his grey flannel suit symbolizes Joe’s love and favorite theme of his paintings—the beauty of flowers. 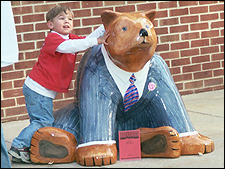 Children love “Pall-(bearer),” sponsored by Ott Funeral Home and fashioned by artist Joe Hoover. Joe tried hard to capture a compassionate, supportive expression on the bear’s face. 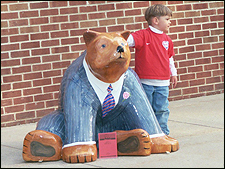 The Ott Funeral Home bear is one of my favorite bears for assorted reasons. One reason is the surprise I felt when funeral director Bill Strock invited me and my students to present the Bear Fever project to him. I remember the moment well. I was in my pool when I called Bill. He was listed as a member of BMBA, and my students and I were calling all members of BMBA and inviting them to learn about Bear Fever and consider being part of the project. Our mission towards community cohesiveness included making sure everyone in the community had some kind of invitation to participate in our community art project. Working toward that mission that summer, we made hundreds of phone calls. On sunny days we made phone calls from my swimming pool. (Imagine us floating on bright pink and yellow boats—phone in one hand, pen and paper in the other.) On rainy days—and there were more of those in July 2004 than there have been since 1902—we took turns inside calling potential sponsors. And so, I vividly remember calling Bill; I was not expecting a welcome to visit him. But he said, “Sure, come on over.” On the appointed day Josie (Moore) and Amanda (Cappelletti) and I met with Bill. I didn’t realize until we started talking that Bill had been one of my students in one of my first years of teaching at Boyertown Junior High West. He asked if I remembered him; I did. And we reminisced about that year in school, some of the projects we’d worked on together, and some of his famous (or infamous) friends. Josie and Amanda were charmed that he and I had such memories to share, and then he invited them to share their experiences with him. “Is she still as crazy?” he asked them. They laughed and immediately provided examples. I was embarrassed, of course, but what a fun time they had sharing teacher stories. When it came time to discuss Bear Fever bears, we were happy that Bill had already decided to become part of the project and wanted to discuss with us what his bear might look like. We considered “heavenly” images—angels, clouds, beautiful skies, flowers. But Bill suggested that he and his staff were in agreement that the bear should look like the traditional funeral director—in suit and tie. 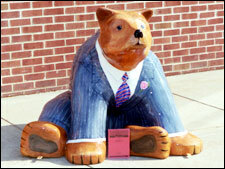 Bill was eager to point out that, like many businesses today, their everyday attire was more casual than in the “old days” when a funeral director dressed formally 24/7, but he explained that the professional image was as important today as in “the old days” and thought it appropriate that his bear communicate the formality of their work. Formality meant seriousness, professionalism, competence—important qualities in the field. The girls queried him on his choice of occupation—expressing their curiosity about why anyone would want to become a mortician. Bill and I explained that helping families during times of crisis was their mission. I recalled my own experiences with Ott Funeral Home when my father died, how very important and helpful the staff was to me and my family when our grief disallowed us from thinking clearly and handling critical details. I’m also especially fond of this bear because his name is “Paul.” I have my own beloved Paul! And how clever they were, with his name, to “play” on a most helpful feature of their business, pallbearers! 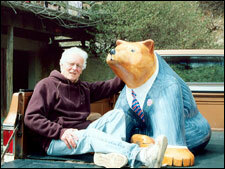 Another reason that “Paul” is one of my favorite bears is because of his artist Joe Hoover. Joe is a retired teacher—just like me! And Joe loves flowers. Me too! His home is a flower garden inside and out. His home is off the beaten path and exists in a secluded spot in the Bucktown countryside accessible only along a dirt road. His home sits high on a hill—almost hidden by the trees. Outside he’s managed to create a garden which grows larger each year. The selection of annuals, perennials, and rose bushes provide a glorious display of color throughout the growing season. He took student Sarah Elphick and I on a tour through his garden, stopping to name some of his favorite specimens and commenting on their history with him and how they’ve inspired him. His home features walls of his paintings everywhere—sometimes three levels of beautifully framed paintings—flowers everywhere! Plus, there are remnants of art shows that he and his family mount each Fourth of July in which his young grandchildren perform assorted dance numbers and /or musical selections—depending on their passions of the moment. These art shows for the family include workshops, games, and demonstrations--opportunities for the children to try new artistic media. We noticed a unique wall divider between Joe’s kitchen and music room made of paper doll-like streamers featuring children and violins which was obviously a leftover from the most recent holiday. Music, art, a love of nature and family enfold this family and enrich their lives. No wonder our bear “Paul” is so inviting. He’s full of the beauty, harmony, creativity, and peace that envelope the home and world of artist Joe Hoover.